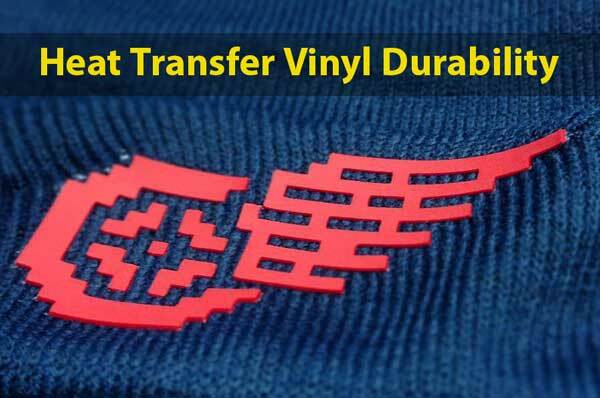 →Heat Transfer Vinyl Durability: How Long Does It Last? Different t-shirt printing techniques have got their own durability properties. This variation is determined by the different relationships that the print has with different types of fabrics. The other contributor is the quality of material used to make the print. This could be ink or vinyl. Different brands and variations within brands determine the end quality of your print. Some prints wear out; others peel while the last group fades. They all eventually die but what makes them last that long? Heat Transfer Vinyl is a technique that uses vinyl, a popular synthetic material to make prints on fabric. The long and short of it is that the best vinyl cutter machine make it desired shape or design. The adhesive side of the vinyl is pressed onto the fabric using a heat press. This technique has sufficiently been described as the best quality in terms of durability and is guaranteed in most cases to outlive the fabric that it has been printed on. This is attributed to the exceptional relative resistance that vinyl has got compared to other materials used to make prints on fabric. Some of these apply across the board while some are specific to particular prints. However, narrowing it down to a particular type of print means looking at the individual characteristics of the same. And, what may cause it to wear out. In the case of Heat Transfer Vinyl, there is a general opinion that it lasts the lifespan of the fabric and beyond. So, What Makes HTV So Durable? It is a physically strong material that can withstand poor fabric handling habits. Its synthetic nature also gives it very strong resistant properties to heat, moisture, and humidity. The material will not warp, shrink or deform in any way when exposed to these conditions. Vinyl being synthetic in nature, allows it to be combined with other materials that enhance its different functions. It is easy to modify its composition to suit particular applications. For example, vinyl used for various functions in the automotive industry has got particular properties but vinyl used to print on fabrics does not have them. It is tailor-made to perform these particular functions. The method used to apply this print is unique. The print does not have a direct relationship to the fabric and is not part of it so to speak. It is simply held on to the fabric by adhesive and is not a direct print to the fabric. As such factors affecting the fabric, do not directly affect the print unless it is really mishandled or intentionally damaged. How Do You Maintain These Qualities? The properties mentioned that give a vinyl print such durability are subject to proper procedures when making the print. Some of these good practices should be included both when making the print. Use the right material for the right job. Even when it comes to vinyl for fabric printing, different variations are available depending on the kind of fabric that you are using. Use the right heat application technique using the right tools that come recommended by the vinyl manufacturer. This includes using a proper heat press machine that has got the recommended heat setting for that particular piece of material. The setting may vary depending on the type of fabric. Such small mistakes which we seldom notice actually have a bearing on the quality of the final product. Sometimes you blame the material, heat press machine, fabric, everything else apart from the human input which is you. Do not use an iron box to heat press. The adhesive that binds the print to the fabric needs sufficient time to dry and settle before you wear, wash, iron and physically handle the fabric in a manner that will disturb the print and glue binding it. It is normally advisable to wait at least 24 hours or as advised by the vinyl manufacturer. While vinyl has got good resistant properties, the adhesive may not. Exposing the same to heat in washing environment when the fabric is constantly disturbed during washing may cause the print to peel off. The glue has got lesser binding properties under these conditions, and any reasonable force on the area around the print may remove it. Wash the fabric in cool water. In the same breath, make sure you turn the garment inside out when washing so that there is minimal direct contact to the print. Be particularly careful when washing the area around the print. This is an interesting one. Bleach contains certain chemical elements that react with the vinyl making it lose its physical strength and also loosens the adhesive bond between the fabric and the print material. You can spot clean areas that have been stained but not immerse the whole shirt into a bleaching agent. For the same reasons you do not wash the fabric in hot water, you should not use a dryer for fabric with vinyl print. The heat from the dryer will damage the print and cause it to shrink. It may also weaken the adhesive causing the print to peel off. The best way to dry a garment with vinyl print is to hang it to dry. Do not soak your vinyl print garment for long before washing. Even then, only soak when necessary. Soaking loosens the adhesive quite fast although you may not notice it the first or second time you soak clothes. The thing is, it will surprise you when it finally gives in, and your print will loosen and come off quite fast after that. Put your printed fabric into the water just as you are about to begin washing. Though vinyl has got reasonably good heat resistance properties, it will not survive direct heat from an iron box. You must always protect the print from the same when ironing by placing a protective layer between the print and the iron. This could be a bed sheet or any other suitable fabric that will not transfer any pigment to your garment during ironing. An alternative is turning the shirt inside out before ironing. Please trust that the print is well fixed onto the fabric and do not try to peel it off at the edges to see how well the print is bound to the fabric. Once a little of the adhesive side of the print is exposed to moisture and other elements, it loses its original binding properties. The result is that the print will slowly start peeling off; the more that is exposed, the faster the rate of peeling. If you correctly follow instructions when making the print using quality materials, then you should not worry about the effectiveness of the technique. It has been tried and tested for years. So, it is the most durable kind of print but only after following all the print instructions. It also involves taking good care of your fabric after that. Otherwise, you can comfortably conclude that vinyl is a reliably durable printing technique. 1. Can you wash heat transfer vinyl? Before I answer this question, let’s talk about the durability of the vinyl. How many times you can wash fabric with heat transfer vinyl applied depends on how durable the vinyl is. A quality vinyl should last as long as the garment lasts if you wash and dry the garment properly. It’s better to turn the garments inside out before washing; it will protect the fabric from abrasion from all of the rubbing. 2. What temp to set heat press for vinyl? Imagine the object that you want to print as frozen beans and the machine as a microwave oven. That should give you an idea on how you should adjust the temperature. Different material requires different settings. Usually, the temperature should be around 350 °F for light colored garments and 320 °F for dark color garments. It’s an approximate value, check what material you are printing and how you should adjust the time before you start to print. 3. Does iron on vinyl last? It depends on the type of heat transfer vinyl that you are using. Normally, the iron-on vinyl will outlast the t-shirt if taken proper care. Never throw an HTV in a dryer. Metallic vinyl such as foil will start to fade. Also, applying direct iron on the vinyl will ruin the graphic. Heat transfer vinyl are normally very durable and most of the time, a good quality vinyl will last longer than the t-shirt itself. However, there are certain criteria to follow if you truly want your vinyl to last. As I’ve mentioned in this article, take proper care of your garment, follow the do’s and don’ts and your vinyl will last a long time. It pays to sit back and read the instructions once in a while. Every vinyl manufacturer will give instruction manuals. Follow us and those tips and what I’ve said here for increased vinyl durability.